Solar lab going up at Alliant Energy headquarters in Madison, Wis.
Posted on August 25, 2015 | Comments Off on Solar lab going up at Alliant Energy headquarters in Madison, Wis.
We’re excited to announce that we are breaking ground this week on our new solar demonstration project. We will be installing more than 3 dozen unique renewable energy features as part of a solar lab on the grounds of our corporate headquarters in Madison, Wis. We expect the first solar structure to be in place next month. More than 1,000 solar panels will be installed from multiple manufacturers, with 11 different types of panels used in all. The primary focus will be to research the operations of the latest solar technologies and how effectively they operate in Wisconsin’s climate. Phase one of the project includes several ground-level and building-mounted solar panels, solar parking canopies covering nearly 50 parking spaces, 13 electric vehicle charging stations, solar café tables and a battery energy storage system. Five of the electric vehicle charging stations will be open to the public. We’ll also be examining information on how the structures work and interact, as well as how they impact building operations. In addition, we’ll research their operation, maintenance and safety aspects. 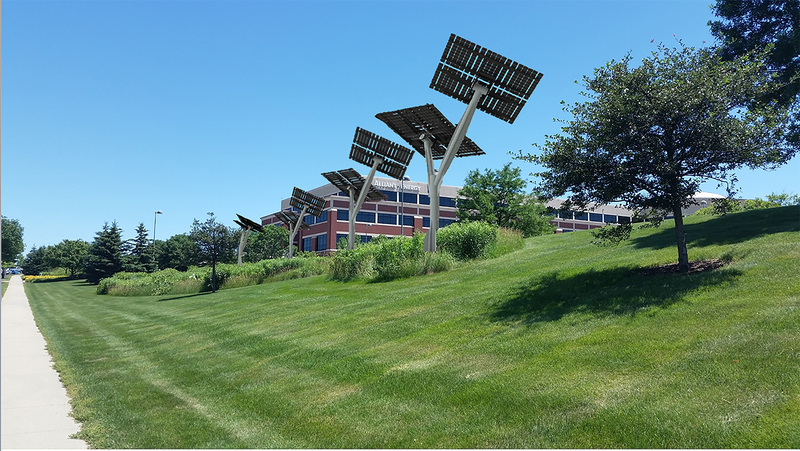 The project will place the solar energy features in various locations, angles and elevations on our office property to see how solar can be optimized in the Midwest. We will share the experience gained from constructing, operating and maintaining the structures. To that end, we are collaborating with the Electric Power Research Institute to collect and analyze site data. We also expect to bring in other partners in the coming months and years to maximize the project’s educational, training, safety and operational benefits. The initial construction phase is expected to be completed by the end of December, with a second phase planned to break ground in the second half of 2016. The initial project investment is expected to be approximately $5 million. The company’s offices at 4902 North Biltmore Lane on Madison’s east side in the American Center business park will be the site for the renewable structures. This project builds on Alliant Energy’s commitment of caring for the environment by utilizing clean energy resources, including over a century of producing hydroelectric power, more than two decades of providing wind power, and assisting more than 1,600 customers with installation of their own renewable energy generation. Comments Off on Solar lab going up at Alliant Energy headquarters in Madison, Wis. This August 11th, Alliant Energy reminds customers to call 811 before any digging project. It’s important for everyone, from homeowners to pr ofessional contractors, to call before you dig all year. We hope this date, 8/11, will be a good reminder. When you call 811, your state’s One Call center notifies utility companies of the project. Homeowners and contractors should call at least three business days before digging. Professional locators will mark the approximate locations of underground lines for free. For additional information, visit alliantenergy.com/call811 or call 811. Twenty-five communities will plant trees this fall through the Branching Out program. Alliant Energy’s Iowa utility has teamed up with Trees Forever to provide this very popular resource for communities for more than 25 years. Branching Out is a collaborative process between the community, its volunteers, Trees Forever and Alliant Energy. 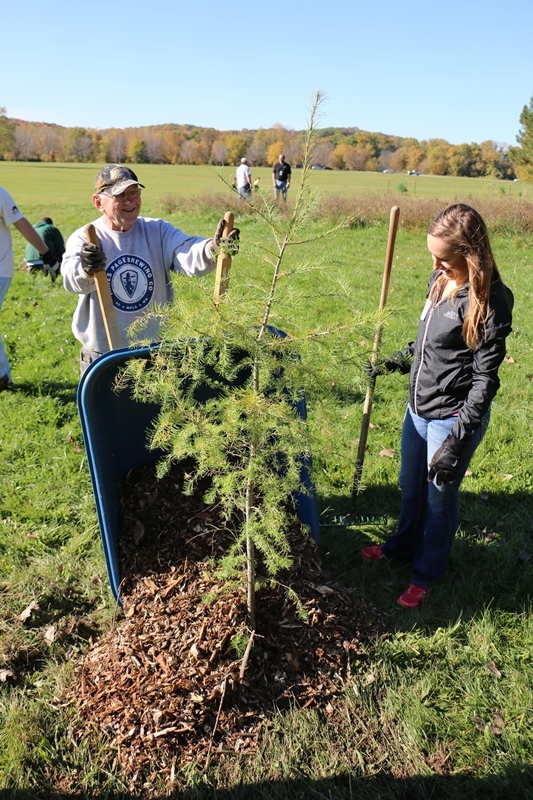 Community leaders create specific tree-planting projects and Alliant Energy provides grant funding for trees. Experts from Trees Forever make sure the projects improve energy-efficiency, teach volunteers to plant and care for trees correctly. Volunteers in 25 communities will help with 30 projects this fall. The grants for all of this work totals more than $132,000. These trees continue the investments Alliant Energy makes to improve energy efficiency across the state. Trees block the sun on hot days and the wind on cold days. Trees also improve the environment by capturing carbon dioxide. For a full listing of the projects this fall visit alliantenergy.com/branchingout, or contact Trees Forever at 1-800-369-1269 or treesforever.org/branching_out.